Centered on my list of design projects for 2015 is a boat I thought I would never see. I doubt anyone would have imagined it, least of all Ole Evinrude, inventor of the outboard engine back in 1907. Evinrude’s first outboard produced a robust 1 horsepower and sported thumbscrews to tighten it to the transom of a rowboat. The original concept was for small, light, and portable power and was never intended as primary power for anything more than a skiff. But that was more than a hundred years ago. From the outboard’s inception, demand forced them to increase in size and power and by 1959 Mercury introduced its mighty inline-6, 70-horsepower outboard. That same year Volvo Penta surprised Mercury when it introduced the first Aquamatic 80-horsepower stern drive, which mated an automotive inboard engine to an outboard steering leg. Not to be outdone, Mercury joined the outdrive game a couple of years later, and it didn’t take long before units were developed that could deliver more horsepower than the largest outboards. 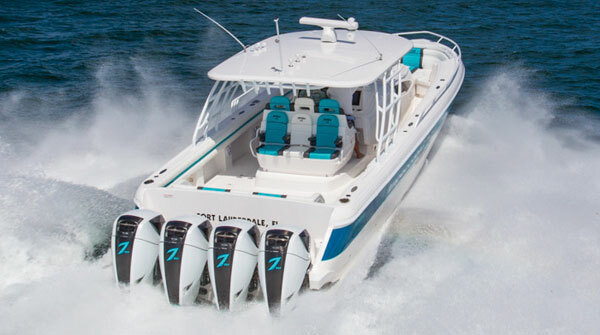 Outboards couldn’t compete with the cheap and easy horsepower available with marinized automotive engines and stern drives went on to dominate the market. For the last 50 years stern drives have been the staple of the pleasure boat industry, powering everything from 16-foot ski boats up through 40-foot express cruisers. Outboards were for small trailerable boats. In 2007 Yamaha came out with its 350-horsepower V-8 outboard and suddenly John didn’t seem so wacky anymore. Had he known about this all along? Mercury then followed with the supercharged 350-horsepower Verado and with three or four of these engines bolted to a 45-footer there was plenty of power available. Then in 2011 Seven Marine appeared on the scene with a monstrous 557-horsepower outboard utilizing an inverted Cadillac V-8 engine. Was this thing for real? The Seven outboard put out more power than any fully warranted inboard/outboard package you could buy. After 50 years, the outboard had finally gained the horsepower advantage over the stern drive and it was about to force them aside. The outboard was ready for big boats. For several years now, big offshore fishing boats have been running triple- or quad-outboard setups and have been capable of 60-plus-mile-per-hour speeds. Companies like Yellowfin, SeaVee, Invincible, and Intrepid build 40-something-foot boats exclusively with outboard power. 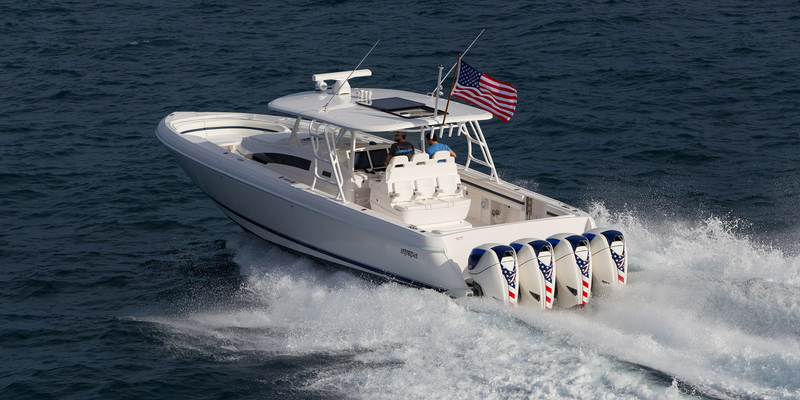 Pursuit, Sea Ray, and Boston Whaler now offer 42s designed for only outboards, because of their superior performance. 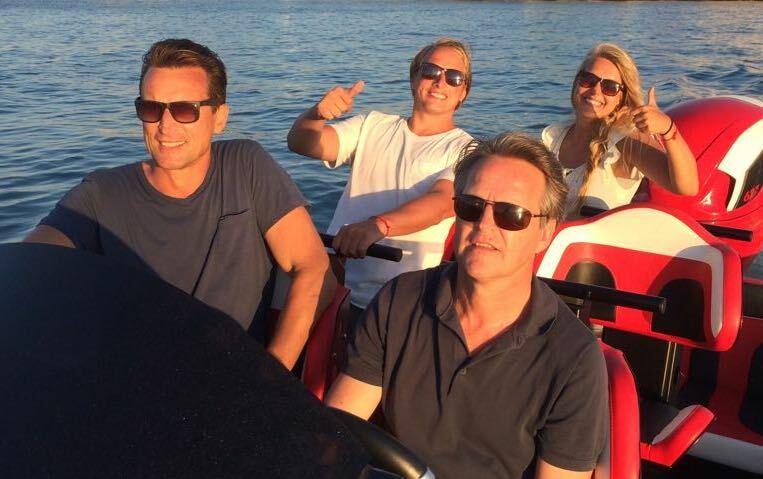 It turns out that people do want these big outboard boats. John Michel was right. So I really shouldn’t have been surprised when we were recently asked to design a 50-foot outboard-powered boat. I should have seen it coming. 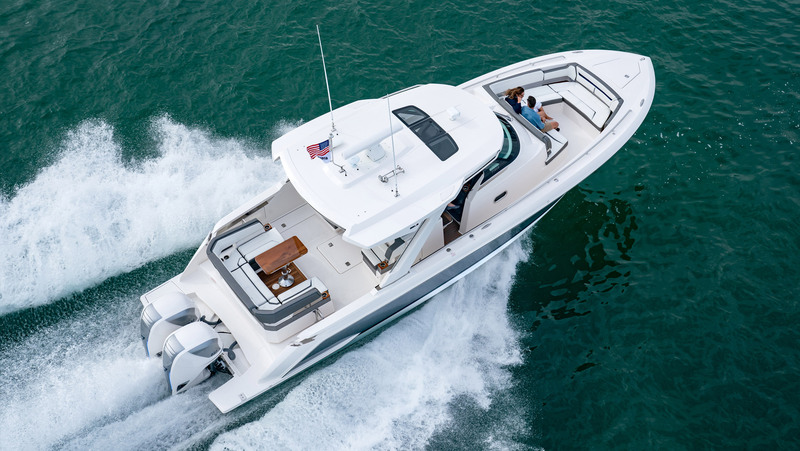 I should have seen the appeal of a 50-foot open sport boat with four 557-horsepower Seven Marine outboards, capable of 65-plus knots. I should have understood the bragging rights that go along with having four $90,000 outboard engines bolted to the transom with their horsepower emnblazoned on their shiny helmets. I should have realized that these huge outboard boats have relegated the Cigarettes and Fountains to extinction. It was just a matter of time until they reached 50 feet. As absurd as it sounds, I now know that someday there will be a 60-foot and probably even a 70-foot outboard boat. I have learned to believe in our little clamp-on engine and not underestimate its potential. Who would have thought it? Certainly not Ole Evinrude. You have to wonder if he would even believe what came of his invention.